Empowering all to learn, create, contribute and grow. SUMMER ACADEMY 2019 - Livingston Public Schools is committed to providing students with excellent educational experiences. Check our what our Summer Academy has to offer - there's something for students entering Grades 1-12 (NEW this summer - Brain Camp for incoming 2nd graders)! Click here for complete details. Kindergarten Pre-Registration for the 2019-2020 school year is now open. Important Note: You need to complete the entire kindergarten registration process by May 15th in order to be notified of your child’s school placement by June 1st. For detailed information, please visit our New Student Registration webpage. Congratulations to Mrs. Bridget Marshall! Absent students must be called out of school by calling 973-535-8000, Ext. 7104. I hope this email finds you well! It's hard to imagine that April is here and we have fewer than 60 days of school left--but, it's true! I am happy to report that our school exceeded the PTA Read-a-Thon's reading goal of 72,000 minutes (about 75,000!) and that the student in each grade who read for the most minutes will have the opportunity to pie me in the face this Friday during our Student Council Assembly! This is a surprise, so everyone will just have to wait and see who these lucky students will be! Thanks to the families who supported the Read-a-Thon and encouraged their children to read towards our school goal and, of course, to Mrs. Dhanoa and other parent volunteers who surely spent days and days looking at reading logs and counting minutes. Much appreciated! We look forward to our annual Multicultural Night next Thursday along with our next session of Caring Communities. We have a Student Council School Spirit Day next Friday (4-12) and are excited to see how students observe "Harry Potter Day"! Please see attached for a flyer from the PTA regarding the upcoming Yard Sale. Calling all donations! Note that donations will be collected during the week we return from Spring Break (Monday through Friday). "Take Your Child to Work Day" is Thursday, April 25th. Parents who plan on participating and not sending their children to school should complete the form that will go home with students shortly. This form will help us account for absences, which, in this case, are excused for participating students. Thank you for your cooperation! Please see the calendar below for upcoming activities and events. Thank you for reading and enjoy the rest of the week and weekend! Thursday, 4-11: Caring Communities, Session #6, 8:25 a.m.
Hillside's Multicultural Night, 6:30 - 8:00 p.m.
Friday, 4-12: Student Council School Spirit Day, "Harry Potter Day"
Mrs. King's Last Day at Hillside; Congratulations, Mrs. King! Mrs. Murray Return to Hillside! Welcome back! NOTE: NJSLA will not be administered on this day. Saturday, 4-27: PTA Yard Sale, Hillside School Upper Gym, 8:00 a.m. to 2:00 p.m.
Week of May 6, 2019--Staff Appreciation Week! Sunday, 5-12: Happy Mother's Day! I hope this email finds you well and enjoying the weekend with your children! We celebrated Read Across America Week with activities centered around names and cultures. We thank you for helping your children complete the name homework assignment. Buddy classes also met with one another that week and we welcomed guest readers from around the community, which included Superintendent O'Neill, Mayor Anthony and Hillside dad, LFD Fire Chief Mullin, among many others. We thank all of our guests for sharing their time and love of reading with our students! Our Read-a-Thon also concluded that day and the PTA parent coordinators of the event are busy tallying up those minutes. While I have not received confirmation yet, I fully expect that we achieved our school goal of 72,000 minutes and to be pied in the face at our next Student Council Assembly in April. Looking forward to it! This past week, our fourth graders visited our friends at Horizon School. They toured the facility and participated as part of the audience for a musical performance by Horizon students. This marks their first visit to the school and we look forward to our visit later this year, where fourth graders will lead station activities for Horizon students. We also had our monthly PTA meeting on Thursday evening, where two representatives from the Livingston Public Library, Anna and Michelle, visited to share with those present information about all of the wonderful resources the library has to offer. Livingston residents are very lucky and I encourage you to visit the library to learn more. Thanks to Anna and Michelle for their time! On Friday, we had our monthly Student Council Assembly where representatives introduced the school to our next pillar of character unit of study, fairness. Special thanks to Miss DePalo's and Mrs. Wallock's classes for their original song about fairness that was set to the tune of Annie's "It's the Hard-Knock Life". It was just amazing! Mrs. C. Dugan's and Miss Trebbe's classes shared about their month with Hank and Holly, respectively. What a fun and busy month it was for our mascot friends! And, we congratulate Mrs. Pacheco's first grade class for being awarded Hank and Mrs. King's fifth grade class for getting Holly! We look forward to hearing all about their time with their new homes at the next assembly. Parent-teacher conferences are scheduled for this week. Families should note that Wednesday, Thursday and Friday are all partial days of school where students will be dismissed at 12:15 p.m. and are asked to communicate any changes to dismissal procedures to classroom teachers in writing as soon as possible. Lunch is not served on partial days of school and we observe an abbreviated specials schedule, so please remember to send in your children with sneakers on physical education days. When in the building this week, please do stop by our "Lost and Found", which we will have set up on tables near the upper gym. If your children have clothing items that have gone missing, please do peruse the tables. Anything left at the end of the week will be donated to charity. Thank you! On Friday, our fifth graders have a special Fifth Grade Half Day Activity from 12:30-2:00 p.m. This is a wonderful and fun team-building experience for students. Fifth grade parents are advised that this is only for students who have signed up. There is still time to sign up and interested families can do so by clicking here. Yearbooks are now on sale and families interested in purchasing a yearbook are reminded that the deadline is March 25th. Students love getting the yearbook and having it as a keepsake, so don't miss out on your chance to get one! As a reminder to fifth grade parents, fifth graders receive yearbooks courtesy of the PTA's Fifth Grade Committee, so there's no need for fifth graders to purchase one. The PTA's largest fundraiser of the year, Husky Madness, is scheduled for Thursday, March 28th. There is still time for families and friends to register for this fun event, and you can do so by clicking here. Thanks for reading and I wish you a wonderful week ahead! Spring is almost here, so fingers crossed for some consistently milder weather! LHS Jazz Band Performance for Hillside Student Body, 9:15 a.m.
PTA's Fifth Grade Half-Day Activity, 12:30 - 2:00 p.m.
Sunday, 3-17: Happy St. Patrick's Day! Caring Communities Session #5, 8:25 a.m. I hope you've enjoyed the long weekend with your awesome children! The PTA Read-a-Thon begins tomorrow! Please encourage and sponsor your children's reading over the next couple of weeks. Remember, if we meet our school goal of a total 72,000 minutes, some lucky students will get a chance to pie their principal in the face as a prize! He can't wait! We have an exciting couple of weeks ahead! Not only does our Read-a-Thon begin, but we are excited about the upcoming Read Across America Week (week of Feb. 25th). This year's theme is "Exploring Cultures through Names" and we have an exciting week of activities planned for students. We do need your help, though, families! Attached please find what will go home tomorrow with your children. There are two documents: a letter about Read Across America Week and a "Name Research Interview Form" that we are asking you to complete with your children by next Monday, Feb. 25th. Thank you, in advance, for your support and please look out for these in your children's backpacks tomorrow! On Thursday, we have our next Caring Communities session where we will continue our work with growth mindset through art. Students will engage in "Making Something Out Of..." by participating in a reading of the book, Ish, by Peter H. Reynolds and then "making something out of" random objects on paper. It promises to be a fun learning experience! On Thursday evening, we will hold our Third Annual TREP$ Marketplace, where participating fourth and fifth graders will have an opportunity to showcase and sell the goods and services they have been developing over the course of the program. Please see the following message from the PTA TREP$ Committee and please come and support our young entrepreneurs this Thursday! You are cordially invited to the Third Annual TREP$ Marketplace at Hillside Elementary School on Thursday, February 21st, from 6:00-8:00 p.m. in the school's upper gym. Please see the attachment for more details. This is Hillside’s third year hosting a TREP$ Marketplace, showcasing our school community’s young entrepreneurs and future business owners. This is going to be another amazing event for the students at Hillside Elementary and we are sure you won't want to miss the innovation of our very own Livingston students! The Hillside community has greatly appreciated your attendance in the past and we hope you will join us once again at the ribbon cutting ceremony at 6:00 p.m.! We have our next Student Council School Spirit Day this Friday. It's Crazy Hair Day and we look forward to all of the crazy hair (crazy hats are acceptable, too!)! Please see the following message from the district regarding a new parent academy on homework that takes place this Thursday at 7:00 p.m. at Riker Hill School. You can head over there after stopping at the TREP$ Marketplace! Last year, the District conducted a survey through the Health and Wellness Committee, within which there were many of questions asked by teachers, students, and parents regarding homework. The results of this survey helped us to continue our work in the District with teachers towards making homework meaningful and manageable. 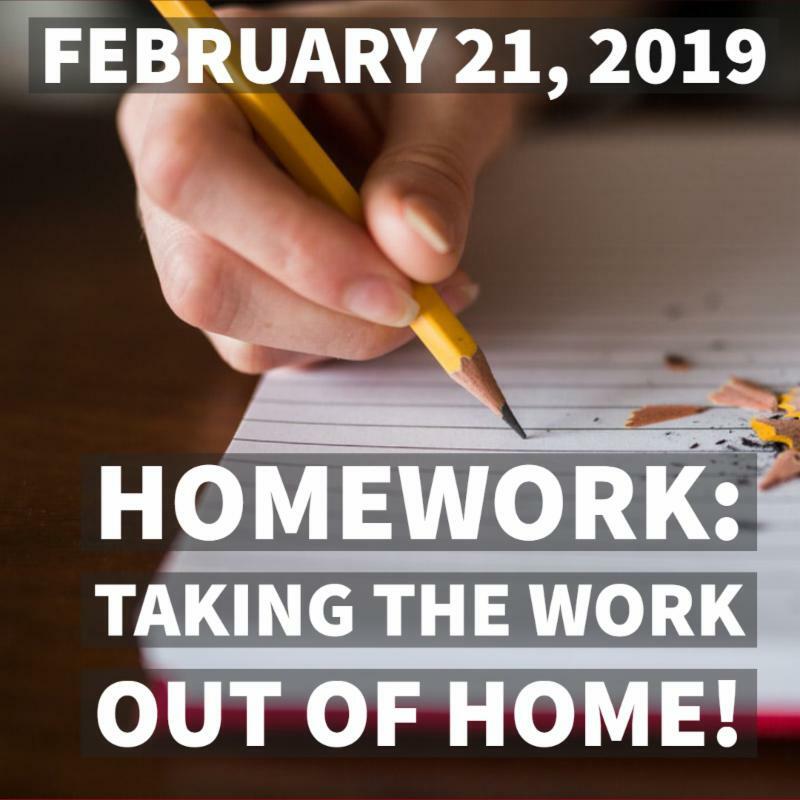 It also prompted our first Parent Academy on Homework: HOMEWORK–TAKING THE WORK OUT OF HOME, which will be held on February 21, 2019 at 7:00 p.m. in Riker Hill Elementary School for all parents of students in grades K-5. We are so excited to offer a night of strategies to support our K-5 families as they manage all of the demands in their lives. We will have nearly 20 staff members, who are experts in their grade levels and their content areas, to offer suggestions across several break-out sessions. We hope you can make it! Please RSVP if you wish to attend. We hope to see you there! Thank you for reading and please check out the upcoming calendar below. Have a great week! Thursday, 2-21: Caring Communities Session #4, 8:25 a.m.
Friday, 2-22: Student Council School Spirit Day--Crazy Hair Day! Week of February 25, 2019--Read Across America Week! School-wide Reading Train, 2:15 p.m.
TREPS Final Workshop, 2:40 - 4:00 p.m.
Friday, 3-8: Student Council School Spirit Day, "Dress Like a Teacher!" Student Council Assembly (Fairness), 1:45 p.m. Happy Groundhog Day! As you may know, two of our most popular groundhog friends, Punxsutawney Phil and Staten Island Chuck, both predicted an early Spring season. Although Phil may not have a great track record, Chuck has done pretty well since 2010; let's hope they're both right this time! Students seemed to enjoy our visit on Thursday from author Peter Catalanatto! His engaging assemblies walked students through his own writing processes, from his personal inspirations for book topics and through the many iterations that occur as books get written. He was captivating and a very nice guy, too! Special thanks to Mrs. Donnelly for coordinating the event! It was so great seeing such a large turnout at Thursday's Skate Night! Admittedly, I woke up with soreness in muscles I haven't exercised since last year's skate night, but it was a grand time! Thank you to the PTA for hosting this fun event and to the families who attended! On Wednesday of this week, Hillside will host its annual SEPAC meeting (by invitation only). We look forward to seeing a great turnout starting at 6:00 p.m. in the school's Media Center. We have our next Student Council Assembly on Friday and can't wait to see what the group has prepared, including how busy Hank and Holly have been over the last month! Please accept this friendly reminder that schools are closed for students on Tuesday, Feb. 5th, in observance of the Lunar New Year. Looks like the weather is going to be great that day! Happy new year to all who celebrate! A note about Valentine's Day: Families are welcome to send in Valentine's Day cards for ALL students in the class. While we appreciate the generosity, students may not hand anything else out besides cards (e.g., NO food or other items). Class parents will make the arrangements for food at class parties and are reminded to clear any food/drink with both the teacher and school nurse. Thanks so much for everyone's cooperation! Thank you for reading, have a wonderful weekend and enjoy the game tomorrow! Thursday, 2-7: TREPS Workshop #4 for Fourth and Fifth Graders, 2:40 - 4:00 p.m.
Wednesday, 2-13: 100th Day of School! Thursday, 2-14: Happy Valentine's Day! TREPS Workshop #5, 2:40 - 4:00 p.m. I hope this email finds you enjoying the week! Our Student Council held its monthly assembly last Friday, this time focusing on our next character pillar unit of study, RESPONSIBILITY. As always, the Student Council executive board and class representatives, along with the three staff advisors, prepared an awesomely informative assembly. Additionally, Mrs. Damante's and Mrs. Marshall's/Mrs. Price's buddy classes did an outstanding job in introducing the student body to a Crayola-inspired approach to examining artwork called SEEK (What do you SEE? EXPLAIN what you see by describing and stating why. What's the EVIDENCE of the artist's intent? What do you KNOW and what do you want to KNOW?). Starting this week, all students will be encouraged to utilize SEEK to examine a piece of artwork that is posted on the bulletin board in the Media Center hall. SEEK will also be incorporated into next week's Caring Communities lesson. Hank and Holly were awarded new homes at the assembly, as well. Congratulations to Miss Viverito's first grade class and to Mrs. Wallock's third grade class for earning Hank and Holly, respectively! We are certain that our mascot friends will enjoy their time with those two classes. And, special thanks to Mrs. Hinds' fourth grade class and Miss DePalo's second grade class for taking great care of our friends and for their awesome presentations! To peruse the Student Council Assembly slideshow, please click here. Thanks to the families who attended last night's PTA meeting. I appreciated the parent participation in our mindset activity and discussion; it was my pleasure learning with you! Attached please find a mindset quiz and scoring guide, along with summarized research about fixed and growth mindsets. Anyone interested in assessing the current state of their own mindsets can simply take the quiz on the first page, and then score responses using the second and third. Additionally, click here for a brief video that was also viewed at last night's meeting. Enjoy and thank you for supporting our latest character education/social emotional initiative, which continues with students at next week's Caring Communities session! We begin our third year with the TREPS program tomorrow. We have over 100 fourth and fifth graders signed up, and cannot wait to see the wonderful ideas that they will bring to life as they launch or continue their entrepreneurial careers! Parents of participating students should have received an email from our PTA coordinator of the program. Families are reminded that students must be picked up at their respective dismissal doors at 4:00 p.m., if applicable (fourth graders at door #8 and fifth graders at door #6). We have our next Student Council School Spirit Day on Friday. Pajama Day is a student favorite, but we do ask that participating students wear their warmest PJs, or clothing underneath their PJs, since we anticipate a typical winter-weather day. Thanks so much for your assistance! Schools are closed on Monday, January 21st, in observance of MLK, Jr. Day. Although we certainly appreciate a day off from school and work to catch up with life and family, we encourage families to engage in acts of service as we remember the important causes for which Dr. King fought so hard. Please consider representing the Hillside School community on Monday, January 21st, as we join the rest of Livingston in honoring Dr. Martin Luther King, Jr.’s legacy by participating in a day of service. Hillside will be leading an art project. Parent volunteers are needed from 10am to 2pm. If you are able to volunteer please contact Alyse Heilpern lyseeb@aol.com. Please see the attached flyer for additional information. Thank you, in advance! Our Winter Concert is set for next Tuesday, January 22nd, where fourth and fifth graders in band, orchestra and chorus will showcase their talents and hard work for the student body in a day rehearsal and then families at the evening show. The evening show will take place in the Heritage Middle School auditorium starting at 7:00 p.m. All are welcome and we look forward to an awesome performance led by our committed and talented directors, Mr. Hegedus, Mrs. Vatoci and Mr. Battista! The annual PTA-sponsored Skate Night is scheduled for later this month. Please see the attached flyer for information and be sure to attend if you'd like to see your principal make a fool of himself! It'll be fun! Also attached is a flyer for the PTA Fifth Grade Committee's upcoming and exciting Spring "Husky Madness" Fundraiser! Our biggest fundraising event of the year with a March Madness feel promises to be a great time, so please try to attend! A note about parking at school: Our staff has grown significantly over the last couple of years and we now have many more staff members than parking spots in our lot. In an effort to provide as many staff members with parking as possible, we can no longer accommodate visitor spots in the lot until further notice. Parents and other visitors must park off site when visiting the school; this includes during morning arrival and afternoon pick up. We will maintain our handicap spots, of course, for legal use and will try to do the same for the 15-minute spot. I thank you, in advance, for your understanding and cooperation until a permanent solution is arranged in the future. Thank you for reading, and enjoy the rest of the week and the long weekend! Thursday, 1-17: TREPS Workshop #1 for Fourth and Fifth Graders, 2:40 - 4:00 p.m.
Friday, 1-18: Student Council School Spirit Day--Wear Your WARM PJs to School! Tuesday, 1-22: Winter Concert School Rehearsal, 9:00 a.m.
Thursday, 1-24: Caring Communities, Session #3, 8:25 a.m.
TREPS Workshop #2 for Fourth and Fifth Graders, 2:40 - 4:00 p.m.
Fifth Grade Yearbook Committee Meeting for Students, 2:40 - 4:00 p.m.
TREPS Workshop #3 for Fourth and Fifth Graders, 2:40 - 4:00 p.m.
PTA Skate Night, Florham Park, 6:00 - 8:00 p.m.
Hello and happy new year, Hillside Families! I hope you enjoyed the break with your children and wish you all the best for 2019! The first, "Eye to Eye", by Camfel Productions, engaged our students in a discussion of seeing others "eye to eye"; that is, seeing one another without judgment or prejudice. The assembly encouraged students to get to know others beneath the surface before passing any judgment. Please ask your children about the assembly and reinforce this important message at home. Thank you and thanks to the Hillside PTA for funding this assembly! The second assembly was to announce Hillside's next "Teacher of the Year"! Each year, the NJ State Department of Education tasks each school with selecting its next deserving teacher. At Hillside, it's always particularly challenging, given the wonderful group of teachers we are so lucky to have, but a school-based committee was able to narrow it down to one very deserving individual...congratulations to fifth grade teacher, Mrs. Marshall! Mrs. Marshall has been in education for 14 years with 10 of them being right here at Hillside. She taught fourth grade for 8 years and is in her second year of teaching the fifth grade. Beyond being an amazing teacher to her students, she is an asset to our school. Mrs. Marshall is a teacher-leader who has influenced school-wide professional development and teaching practices, and serves as one of the school's assistants to the principal. We are all very proud of her and I know you will join me in congratulating this most deserving teacher. In staff news, we say goodbye this week to Mrs. Sledgeski, special education teacher who has been filling in for Mrs. Yersak. We thank her for her service to Hillside's students and wish her well at Harrison School, where she continues the school year in a similar role. We also welcome back Mrs. Yersak on Friday, who has been on maternity leave bonding with her first child. Thank you, Mrs. Sledgeski, and welcome back, Mrs. Yersak! We look forward to our Student Council Assembly on Friday and to a great week ahead! Thank you for reading and have a wonderful week! P.S. Please see below for an updated calendar of school activities and events. Thank you! Thursday, 1-10: Mrs. Sledgeski's Last Day at Hillside; Thank you, Mrs. Sledgeski, and best wishes at Harrison School! Student Council Assembly, 1:45 p.m. I hope this email finds you well and excited about the upcoming time off with your children! We had a wonderful Caring Communities session yesterday, where we continued our work with the growth mindset through the "Power of Yet". Your children should have brought home a "Yet Ball", so please ask them about what they learned and encourage them to use the ball when they are displaying a fixed mindset by saying things like "I can't do this" or "This is too hard". Remind them that they have the Power of Yet at their fingertips and that this power turns impossibilities into possibilities! Yearbook flyers went home with students this week. If interested, please be sure to order by the due date in March. Attached for your convenience is a "Yearbook Message Orders" flyer (also went home this week) for families interested in placing personalized messages into the yearbook . Note to fifth grade families: the PTA's Fifth Grade Committee generously provides all fifth graders with their yearbooks, but you certainly can order for children in other grades should you choose. Thank you! Special thanks to our amazing PTA and the many parent volunteers who coordinated our annual Staff Holiday Luncheon that we all enjoyed yesterday. Everything was absolutely delicious and we are so thankful for the effort and love that was put into the event. It is hard to believe that 2019 is almost upon us. I want to thank you for your support this year and look forward to a happy and successful new year with your children. Have a wonderful break and a Merry Christmas to those who celebrate! Enjoy your children and we'll see you next year! Tuesday, 1-1: Schools Closed, Happy New Year! Teacher of the Year Announcement Assembly, 2:00 p.m. I hope you've enjoyed the weekend with your children. Happy Hanukkah, if you celebrate! Congratulations to Mrs. Hinds' fourth grade class and Miss DePalo's second grade class for being awarded our mascots Hank and Holly, respectively, at the last Student Council Assembly! We thank our Student Council for kicking off our next character pillar of study, Citizenship. Representatives and advisors meet on their own times to prepare for these assemblies are we are always so impressed by the results. How did the main character, Vashti, change from the beginning of the story to the end? What did her teacher say and do that made Vashti think differently about her ability to draw? What do you notice about her interaction with the boy at the school art show? CHALLENGE QUESTION: Why is it necessary to be mindful when working towards a growth mindset? Thank you for your follow-up and support! We kick off the week tomorrow with MatheMagic! assemblies, courtesy of our wonderful PTA. Students will be exposed to math concepts and problem-solving through tricks and illusions. Should be a great one! Our friends from Horizon School will visit our fifth graders for the first time this year on Thursday for our annual Hillside-Horizon Holiday Sing-a-long. We look forward to seeing them and singing in the holiday season! The PTA Holiday Shoppe is just around the corner. It will be held on Wednesday, December 5th through Friday, December 7th. We need parents volunteers to assist the students in their holiday shopping and to help set up the shop on December 4th. Signing up is super easy, just click here: http://signup.com/go/RjTNaUc If you have any questions please contact the committee chairs, Ana (anasimpson@yahoo.com) or Nicole (nicolebeeney@gmail.com). Attached please find the December lunch menu for your convenience. Friday, 12-14: Student Council School Spirit Day--"Ugly Sweater Day!" First Marking Period Report Cards Available to Parents in Genesis Portal, After 3:00 p.m. I hope you enjoyed the weekend with your children and that this email finds you well. We have a short week ahead, with a partial day of school on Wednesday. For Wednesday, please be sure to make arrangements to have your children picked up at 12:15 p.m. Buses and aftercare will run as usual. Changes to regular dismissal procedures must be communicated to your children's teachers or the main office in writing or with a phone call. Thank you! We have a busy day on Monday! The Starlab Portable Planetarium will be at Hillside for the day and will set up in our lower gym. Classes are scheduled to visit the planetarium throughout the day, where students will surely enjoy a simulated space experience full of learning. We look forward to it! Also on Monday we kick off our continued Hillside-Horizon School partnership with a Disability Awareness Training for our fourth graders, courtesy of Horizon School staff. This activity is the first of a series where our fourth and fifth graders will work with Horizon School and its students this year, and we look forward to seeing our Horizon friends soon! Our Student Council Assembly that was scheduled for last Friday will now take place on Tuesday. Our Student Council executive board and representatives have worked hard to prepare us for our next character pillar unit of study. We are also excited to hear about Hank and Holly's experiences in their current homes and to see where they go next! We have a Student Council School Spirit Day on Wednesday. It's "Mustache Day", so please have your children show their spirit by coming to school with their finest facial hair! PTA Pie Sale pickups are scheduled for Monday and Tuesday of this week, as noted in the calendar below. As a reminder, those picking up pies should use Door #2, which is to the left of the main entrance (around the corner; it's the aftercare pickup door). Thank you for supporting the pie sale and enjoy those delicious pies! As we approach Thanksgiving, we tend to reflect upon things in life for which we are thankful. Beyond my wonderful family and friends, I continue to be thankful for the privilege it is to be part of such a wonderful school community. I am so thankful to do something for a living that I love, in a school of staff and students that I love. I thank you, Hillside families, for allowing us to be part of your children's lives. I wish you a wonderful Thanksgiving holiday with your families and loved ones. Student Council School Spirit Day--Mustache Day! I hope you've enjoyed the weekend! Thanks so much to the families who have donated items for "Operation Gratitude" so far. We've collected quite a bit, but there's still time! If you have not, please consider donating an item that will be used by our fifth graders and local veterans to put together care packages for troops overseas on Monday, November 5th. The collection ends on November 1st and the flyer that was sent last week with complete information is attached for your convenience. Thank you! The PTA's Scholastic Book Fair begins this week with Thursday evening's kickoff event where books will be displayed and available for purchase. There will also be some fun activities, including story time in the library with some of our staff members! It promises to be a lot of fun! Attached is the flyer with information for anyone still wanting to volunteer. Please sign up soon! Students will also have an opportunity to shop during the school day on Friday, and next Monday and Tuesday. Please also see attached for the shopping schedule. We also started our "All for Books" Coin Collection on Friday with the penny collection. Proceeds from this collection go to fund teachers' class libraries and to fund books for schools in need. We continue tomorrow with collecting nickels, Tuesday with dimes, Wednesday with quarters, and then Thursday with all coins. Please consider supporting this collection! Thanks, again! The PTA is also hosting a pie sale and I hope many of you had an opportunity to pie-taste on Friday morning! A copy of the flyer is attached. Pies can be purchased at this link: https://goo.gl/8KFdsm. If you like pies, you'll definitely enjoy these! It looks like the weather is going to be great for an outdoor parade on Halloween! Attached (not attached on site) please find the Halloween letter and parade route map that was sent home a couple of weeks ago. The parade will begin at about 1:15 p.m. Students will exit and re-enter the building through door #9 allowing for onlookers to see students twice as they parade around the property, so please feel free to spread out along the parade route (no need to crowd the door!). Attached please find an updated flyer from the Fifth Grade Committee that includes a QR code for families who are interested in supporting the event. Thank you! Families are reminded that the school day starts at 8:05 a.m., which means that all students should be in the building and awaiting their teachers by that time. While we understand how busy mornings can be and that traffic conditions around the school can be difficult, it is important that students start their days on time with the rest of their peers. Please remember that we open up at 7:35 a.m., which gives families a full half-hour to get kids into the school. Thank you for your understanding and cooperation! Our "Lost and Found" has accumulated a healthy supply of sweatshirts and T-shirts, among other items. When you visit us for parent-teacher conferences, please take a minute to browse the collection for any of your children's clothing items or other belongings that have gone missing. We'll also encourage your children to do the same this week. Any items remaining on Wednesday, November 7th, will be donated to charity. Thanks so much for reading and enjoy the week ahead! Halloween Parade and Parties to Follow, Starting at 1:15 p.m.
PTA's Scholastic Book Fair Kickoff, 6:00 - 8:00 p.m.
Sunday, 11-4: Daylight Savings Time Ends, Clocks “fall” back one hour! Summer Bridge Pizza Party for K and 1 Students, 11:00 a.m.
Friday, 11-16: Student Council Assembly, 1:45 p.m. In order to ensure the safety of our students, parents should use the Call For Safety phone line and report the student’s name, day or dates the student is absent or tardy, and the reason for the absence or tardy.